In Western blotting, it recognizes proteins in MW range of 265-400 kDa, identified as different glycoforms of EMA. The α subunit has cell adhesive properties. It can act both as an adhesion and an anti-adhesion protein. EMA may provide a protective layer on epithelial cells against bacterial and enzyme attack. The β subunit contains a C-terminal domain, which is involved in cell signaling, through phosphorylations and protein-protein interactions. 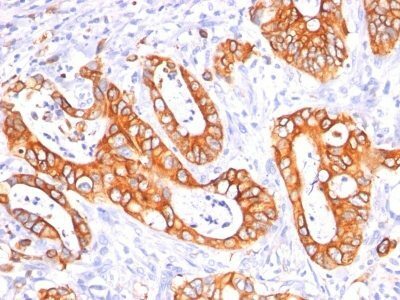 In immunohistochemical assays, it superbly stains routine formalin/paraffin carcinoma tissues. Antibody to EMA is useful as a pan-epithelial marker for detecting early metastatic loci of carcinoma in bone marrow or liver. Catalog number key for antibody number 0743, Anti-CD227 (GP1.4 E29) The prefix indicates conjugation, followed by the antibody number and size suffix.